Cronos (1993) was Guillermo del Toro’s auspicious feature film debut and it established him as an up-and-coming horror film auteur. Hollywood came calling and he made Mimic (1997), a compromised vision that still had Del Toro’s stylistic flair, but was ultimately sunk by too many cooks. Del Toro went back to his roots and made The Devil’s Backbone (2001), an atmospheric ghost story that plays out like a gothic Aesop’s fable. It is 1939 and the Spanish Civil War is gradually coming to an end. A young boy named Carlos (Tielve) is left at an orphanage by his tutor. Upon his arrival, Carlos notices two peculiar things: an unexploded bomb sits in the courtyard, imbedded in the ground, and he sees the spectral image of a boy standing in a doorway. Del Toro has already subverted our expectations by having this apparition appear during the day (the stereotype would be at night) and with Carlos’ reaction. He isn’t scared or freaked out, but rather intrigued. He has already seen so much that nothing much fazes him anymore. The orphanage is run by Dr. Casares (Luppi), a wise, kind old man and his wife, Carmen (Paredes). He is a man of science who does not believe in ghosts. As he says at one point, “Sometimes I think we are the ghosts.” Casares is at odds with the orphanage’s handyman, Jacinto (Noriega), a cruel person who is after a stash of gold stored in a safe. As Casares observes, “Fear sickens the soul,” and this is what has happened to Jacinto. He has become tainted and corrupted by fear and desperation. Del Toro opts for a warm, amber color scheme that goes well with the expansive desert landscape that surrounds the orphanage and gives the movie an antique feel. The director uses his location well. The camera roams the hallways, peers under beds and wanders into rooms, giving a real sense of the place. He also plays with shadows and darkness to create an ominous feeling. It is what we can’t see that is the most frightening aspect of the film. He also makes excellent use of more natural elements instead of relying on digital effects and fancy camerawork. The special effects for the ghost are a clever mix of good ol’ fashion prosthetics and modern CGI, but Del Toro wisely uses the latter sparingly. This understated approach to the film’s style places more emphasis on its story, its characters and the performances of the actors. The attention to detail is also very well done. For example, the character of Jaime (Garces) isn’t a simple one-dimensional bully as we are initially led to believe. As Carlos befriends him, we learn that Jaime aspires to be an artist. There are also little visual touches, like the lone ribbon attached to the bomb that flaps in the wind, that don’t overwhelm the film; they are just enough to enrich the story. 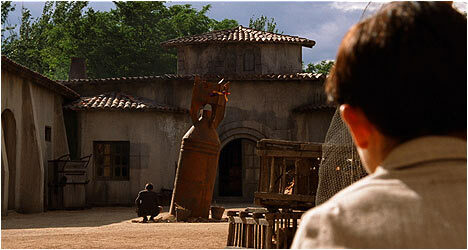 The Devil’s Backbone is a movie steeped in Spain’s rich tradition of magic, superstition and religion. The movie has modern resonance and meaning. The kids who live in the orphanage have nothing but what they brought with them. They are kind and respectful, for the most part, and don’t feel that the world owes them something. Del Toro seems to be saying that it’s not what you don’t have but what you are given that is important in life. The Devil’s Backbone is an evocative film that stays with you long after it’s over. The good news is that all of the extras from the 2004 Sony special edition DVD have been ported over with several new extras added into the mix. The first disc includes a brief, new introduction by Guillermo del Toro talking about what this special edition has to offer. He contributes an impressive audio commentary, talking about his aim to take the gothic romance novel and transport it into the Spanish Civil War. Del Toro was also interested in fusing the war genre with the ghost story. He goes into great detail dissecting the elements of the gothic romance and how it applies to his film in a very accessible and articulate way. There is not a single lull in this highly engaging and informative track. Also included is a trailer for The Devil’s Backbone. The second disc starts off with “Summoning Spirits,” a new interview with Del Toro where he talks about the gothic horror genre and how he created the ghost of Santi. The director talks about his drawings for the character and why he looks the way he does. We see how Del Toro achieved his vision and the special effects work that went into it. This is a fascinating look at the process. “Making of Documentary” is a 27-minute look at various aspects of the film. They are broken down into six segments that can be viewed separately or altogether. Del Toro and his co-screenwriter, Antonio Trashorras talk about the film’s classic ghost story and how they tried to put an original spin on it. The director, with his art director Cesar Macarron, talk about the look of the film and how they wanted characters to be framed in archways — “Humans confined by architecture,” as Del Toro puts it. This is an excellent look at how the movie was made and told in a concise and informative manner. “Spanish Gothic” is a new extra that sees Del Toro talking about The Devil’s Backbone and Pan’s Labyrinth (2006) and their relationship to the Spanish gothic genre. He talks about the origins of the film’s title, steeped in Mexican folklore, and how he changed it to fit the Spanish setting. Del Toro also talks about how he tried to create something new within this genre. “Director’s Notebook” features a few scribblings from Del Toro’s notebook. It is interesting to see how much the finished film reflects these drawings. “Designing The Devil’s Backbone” is a new interview with Del Toro, which examines the art direction and set design, singling out several key collaborators. A lot of planning and work went into the look of the film, from costumes to the content of the rooms, and it all had a purpose or a meaning. There are four deleted scenes with optional commentary by the director. He explains that they were cut mostly because they slowed down the pacing of the movie. “Sketch, Storyboard, Screen” allows one to watch parts of the film with selected sketches by Del Toro that he did for certain scenes. These drawings pop up in the corner of the screen so as not to obscure the entire frame. You can also compare six scenes from the film with the thumbnail drawings, storyboard and the final product simultaneously. There is also a gallery of sketches and drawings of characters, sets, and the special effects. Finally, there is the “War of Values,” featuring Spanish Civil War expert Sebastiaan Faber examining the role that this historical conflict plays in The Devil’s Backbone. He provides a brief rundown of the war and puts it in the context of the film. This is an informative look at the historical backdrop to the film.